Most of us have been surprised by the current partial government shutdown and how long it’s gone on. It’s on track to be one of the longest shutdowns in history, longer than 2013 (16 days) and getting very close to the 1995-96 shutdown (21 days), which it will pass by the end of this week. Just because government is shut down doesn’t mean you’re completely out of luck trying to sell into government. You just need to be aware that folks may be under greater than normal degrees of stress and maybe be overworked. That may mean they’re less likely to be in a position to take your call. So, who’s working and who’s not? Well, for starters, we need to clarify the difference between essential and non-essential personnel. It’s pretty simple: essential personnel at affected agencies are working without pay, whereas non-essential personnel are furloughed at home. Essential personnel are ‘emergency’ personnel who are critical to safety or national security. The departments shut down include: USDA, DOC, DOJ, DHS, DOI, DOS, DOT, HUD, as well as major independents like NASA and the EPA, and a lot of smaller entities that probably don’t affect your sales. It’s safe to say that, over the last few years, industry and government have both gotten used to a certain amount of dysfunction in the appropriations process. We haven’t had a full package of 12 appropriations bills since 2008; some combination of omnibus appropriations and continuing resolutions (CR) is the new normal. However, even by those standards, this fiscal year has been rocky – a series of short CRs, followed by the first government shutdown since 2013. In the end, that shutdown lasted less than a day, as Congress passed a CR funding the government through Feb. 8. This is good news in that our customers have appropriations again, and can keep the lights on for the next three weeks. If you’re lucky or were working on closing deals before funding expired on Jan. 19, those contracts may close during this CR. Unfortunately, there’s a downside to the deal: Without getting lost in politics, there’s a very good chance that we’ll be right back where we started when this current appropriation period ends. The Senate and the House passed a Continuing Resolution (CR) today, which the President can sign by midnight to fund government at FY15 levels through December 11. What happens after the December 11 deadline is up in the air, but we’ll either see more CRs for the rest of the year, or an omnibus (like what we had in FY15). 12 appropriations bills passed by the House and Senate and signed by the President by October 1 appropriating funds to each of the government agencies. These appropriations bills combine for over 20,000 pages of text and provide significant clarity from Congress on how money should be spent. This hasn’t happened since 2008. Twelve appropriations bills are consolidated into 1. Agencies do receive new funding levels for the year and new programs can start, but the bill is significantly shorter (roughly 2,000 pages, compared to the 20,000 pages of the full budget) and lacks the direction from Congress on how the money should be spent. FY15 ended on an omnibus. 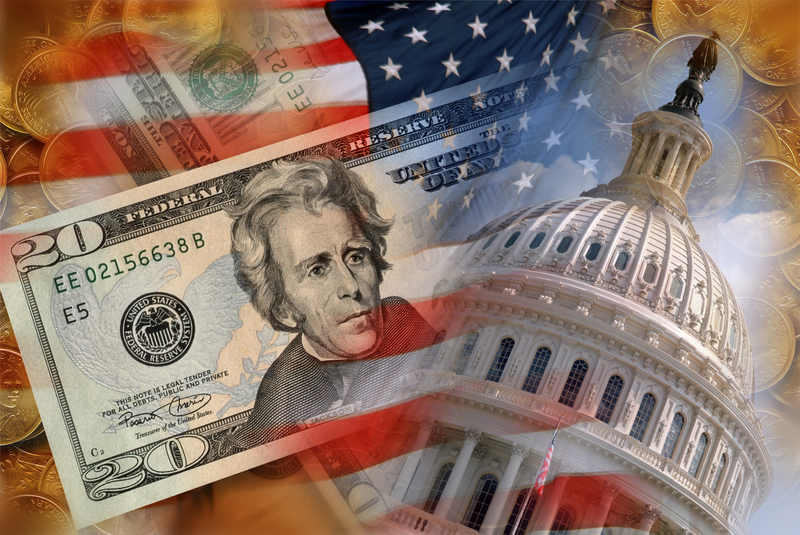 A combination of a CR and an omnibus – funding some agencies at new levels for the fiscal year, while other agencies are dependent upon prior year spending levels. Appropriations bills were not passed and new budget levels cannot be agreed upon in Congress. A CR is a stopgap measure allowing the government to remain open and funded, but at the prior year’s spending levels, and no new programs can be started. Congress can’t agree on any aspect of funding, and all non-essential governmental functions are suspended until a budget can be reached. The bad news: The shutdown cut about 0.6% off forecasted 4th quarter GDP growth. An estimated 100,000 jobs were lost across the country (it is unclear how many of those will be recovered), and the shutdown pushed consumer confidence to its lowest point in 8 months. The good news: Government spending will continue. The main hit was felt by services contractors, because they can never recoup lost billable hours from those 3 weeks. However, the IT products that agencies needed a month ago will still be needed in a month, so they’ll still be purchased. Albeit forecasts are off… but at the end of the day IT product companies will still realize the revenue. The most recent legislation suspended the debt ceiling until February 7, and the Continuing Resolution (CR) funds government discretionary budgets at an annualized level of $986 billion until January 15. There is no reason to believe that a budget deal will be reached, so we can expect further last minute CRs to occur throughout the year. Hopefully we’ll see an omnibus that will at least provide appropriations for certain agencies – so that those agencies will no longer have to reference FY12 or FY13 budget numbers and agencies can begin new programs. But regardless of whether we see more CRs or an omnibus, you can expect agencies to remain hesitant to make large purchases (as they were last year). The $986 billion is $19 billion above the post sequestration Budget Control Act (BCA) caps – so unless Congress amends the BCA, we’ll be going through another round of sequestration again in FY14. I expect we’ll see a flurry of RFP activity in March/April again as agencies will want to hold on to funds and not obligate them until August/September (they know the contracting process takes 5-6 months). Trade Shows – As expected, these are either being postponed (like GEOINT 2013 Symposium and NextGov Prime) or cancelled altogether. GEOINT organizers noted that the recently-passed “Pay Our Military Act” allowed most Defense Department personnel to return to their jobs alongside the excepted personnel who were still working. However, it also included language making it impossible for personnel to travel (except in direct support of operational forces) or attend events. Other Events – We’re seeing the cancellations and postponements extended beyond trade shows to include tabletop events, single-vendor events, user groups and others. Date Conflicts – As event dates shift to the right, many are encroaching on other events planned for the same time periods, which will cannibalize attendance and increase competition for eyeballs (even within the same organization in some cases). Promotion of Future Activities – Even if your webinar or event is supposed to take place in November or later, you still need several weeks of runway to promote it. Many Feds can’t check email or answer their phones, and those that aren’t furloughed likely have other priorities on which to focus. Don’t forget to review your promotional plans and adjust accordingly, especially as we creep closer to the holidays. Government Speakers – Getting travel approval was difficult enough already. In addition to that headache, many Public Affairs offices aren’t open to approve speaker participation for upcoming or future events. Even if your likely speakers are still on the job and have approval, they’re likely unable to speak anyway as that won’t be considered an “essential” function. Messaging – Try getting a word in edgewise with PR, social media, and content marketing…all anyone wants to talk about is the shutdown, which crowds out every other message we’re putting out there. Once your prospects return to the office, they’ll be focused on catching up on several weeks of work that were missed. Getting their attention will be more challenging than ever, and it’s likely to take more time and effort. Paid Media – Many print, radio, and online ad campaigns are already running and can’t be undone. Sales Follow-up – One silver lining with the shutdown’s timing is that not many marketing campaigns take place in September. However, for those with longer sales follow-up cycles, it will be harder to reach recent attendees to try to pour names into your pipeline and document ROI. Focus on DoD First – Not everyone is there, and those that are may not be interested in talking right now, but civilian agencies will be hit harder and take longer to dig out when they return. Contact Event Organizers and Speakers – Make sure you understand how the shutdown is impacting those events for which you’ve made a commitment, how promotional plans will be adjusted, whether speakers are still planning to participate, and what recourse you have if things don’t progress as planned. Adjust Your Plans – Analyze your annual campaign calendar, upcoming email blasts, and budget, all with an eye towards minimizing lost value or creating campaign overlap/conflict in the coming months. Clean House – It’s always difficult to take the time to close out old campaigns, perform list maintenance, and summarize the results of what you completed last month. Catch up on best practice articles, see what the competition has been up to, and join those social media groups you haven’t had time to think about. Now might be your chance. Engage with Channel Partners and Systems Integrators – Many of them have extra time on their hands right now, so it’s a great time to reach out and build relationships. Update them on your new products, value proposition changes, competitive differentiators, changes to marketing plans, etc. Do Your Homework – Any down time you may experience today can be used to make tomorrow’s activities more effective. If you subscribe to GovWin IQ or a similar service, do some research now to ensure your upcoming plans are as targeted and relevant as possible. If you’re an immixGroup client, make sure you tune in to watch our upcoming FY14 Market Intelligence Budget Briefings, and use the information to build and review territory plans with your sales team. During times like these, communities like ours need to pull together. Please post your own ideas or thoughts on how we as government marketers can all get through this man-made crisis and emerge stronger when our customers re-open their doors.